Left: Rolf de Groot, former Head of the Robotic Exploration Coordination Office. It may seem unusual for a biologist to be chosen as Head of the Robotic Exploration Coordination Office at ESA, but it’s hard to pigeonhole Rolf de Groot (1964) into just one scientific discipline. As a child growing up in Deventer, the Netherlands, Rolf's early career aspirations tended towards forestry and studying animals but when the time came to make a choice he opted to study biology. After completing a Bachelor's degree in Molecular Biology at Utrecht University in the Netherlands, Rolf pursued a Ph.D. in Molecular Oncology, during which time he received a grant from the Netherlands Institute for Space Research (SRON) to study the influence of microgravity on the growth of cancerous cells. His research provided insights into the mechanisms that control how these cells grow and into why astronauts feel unwell following long periods of time spent in space. For the early part of his career, from 1992-2000, Rolf put aside his space-related research and worked solely in the field of molecular biology. However, he gradually became frustrated with specialising in just one particular scientific field and he was eager to return to the space arena. In 2000, a new role as Programme Manager at SRON gave Rolf the career change that he was looking for. In this position, Rolf was responsible for selecting Dutch science projects for the International Space Station, Earth observation and planetary missions. It was in this role that Rolf began working with ESA, as the Dutch delegate for many of its space programmes, including robotic exploration, and the Chairman of ESA’s Programme Board for Human Spaceflight, Microgravity and Exploration. After leaving SRON, Rolf then joined the Netherlands Space Office in The Hague as Head of the Science and Applications Division. 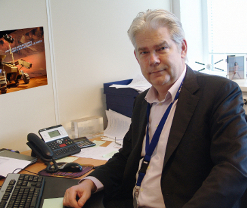 In October 2011, Rolf was appointed as the Head of the Robotic Exploration Coordination Office at ESA. Rolf is married with two sons and a daughter, aged 15, 13 and 10. He loves going to restaurants with his family and friends, watching movies, going to concerts and gardening. Rolf, what does your role as Head of the Robotic Exploration Coordination Office entail? I liaise with the Member State delegations to ESA, informing them about current and future activities. I am also responsible for the overall coordination of the robotic exploration plans, including the preparation of new programmes for consideration by the ministers of the ESA Member States. Furthermore, I oversee the plans for cooperation with our international partners. Last, but not least, I support the Directorate of Science and Robotic Exploration in establishing a coherent approach to exploration, in collaboration with other ESA directorates, such as Human Spaceflight and Operations, and Technical and Quality Management. Why did you choose to work in robotic exploration? For me, robotic exploration is one of the most exciting and important programmes for ESA. Going to other planets and doing exciting scientific experiments, which are paving the way for future human missions, is extremely challenging and inspiring. Proposing a single exploration programme for an international space community, which responds to the different priorities of our partners, is a difficult task. Being able to build a programme with the space agencies in Russia and USA – and maybe later China, India, and Brazil – that complement rather than compete with each other, is very challenging. Another important challenge at the moment is the need to safeguard the ExoMars programme. ESA has already identified a technically viable scenario with the Russian Space Agency, Roscosmos, after the international cooperation with our American counterpart, NASA, was terminated earlier this year. I enjoy working in an international setting, meeting people from a diverse range of political and cultural backgrounds, where everyone is trying to reach a common goal. Even though the Dutch are quite open to the rest of the world, The Netherlands remains quite a small country. Working on a day-to-day basis with people from all over Europe, and also with our Russian and American partners, is giving me a much broader perspective. What inspires you about Mars and the robotic exploration missions? Mars is obviously far away, but robotic exploration missions bring it within our reach. We already know so much about Mars, mostly from NASA missions, but also through ESA’s Mars Express. It is very exciting that, thanks to missions like these, you can feel like you are actually there. The biggest question is whether there was ever, or if there is still, life on Mars – I am trained as a biologist, after all! ExoMars is an important mission because it is the first one with the right equipment on board to discover classes of organic molecules that could hint at the past existence of life. All of the other questions are secondary to this one, although the discovery of geophysical activity on Mars would also be incredibly interesting. What is your hope for the future of robotic exploration? My hope and vision is that ESA will have a robust robotic exploration programme, with regular launches (preferably at every Mars launch window) and a planning horizon of about 15-20 years. Only then can we reap the full benefit of robotic exploration.